August 25, 2014 Martial Arts, Muay Thai, Personal Development, SportsThe Little fighter still has a big heart. If I cast my mind back to when I first started training ( I say first started I’d been training for a couple of years if memory serves me correct) I can remember what a big step up it was when I stepped out my comfort zone and was bold enough to do an interclub. I felt more nervous than I’d ever felt about anything ever.. Up until the point I stepped into the ring, my nerves had been giving me a hard time but then when I had the choice of either letting myself get a going over or defending myself and taking the fight to him, I decided to take the latter option. It wasn’t spectacular it wasn’t incredibly technical ( I think I spent the majority of that first interclub low kicking my way through three rounds ) but what I was doing worked, and it was a good push. Most importantly it helped me deal with the fear of having to fight. Fast forwarding a year or so later to my first fight, I was pretty much in the same space mentally. It wasn’t until I was walking to the ring that my nerves settled and I felt focused. Just before, as my trainer had wrapped my hands and then had rubbed Thai oil into my muscles (there’s nothing like that smell or that burn is there?) I felt an air of acceptance settle in, this was happening like it or not and I had to do my best to win. Although I lost it was a close fight, but again I felt like I had achieved something. I’d taken a step outside my comfort zone and a whole new world of possibilities presented themselves. And of course, I’d proven to myself that I have what it takes to step up and now all I had to do was win. It took a little time and a lot of perseverance but in the end I beat that little hurdle too. 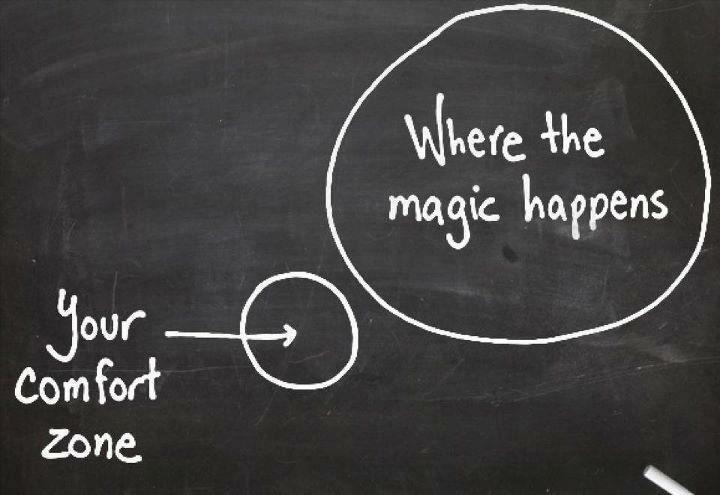 Comfort zones. It seems that every time I step out of one it seems that another challenge or goal (a bit of both in all honesty) requires that I step a little bit further than before. When it comes to fighting if you find yourself constantly in a comfortable space then I guess your doing it wrong. Training for competition and fighting in itself is about pushing yourself further than you thought you were able to go in order to succeed. As the great Muhammad Ali said it’s about having last minute stamina and the will to win as well as the skill. Being able to flick your on switch for me is an important part of fighting, and despite having stepped into the ring on more than one occasion now it’s still not always something that comes easy.It’s very easy to put this down to the individual, but let’s face it for most people stepping in a ring with the intention of taking the other person to pieces isn’t an easy thing to do. It takes a lot of courage. It takes a lot of heart. And if you lose it takes even more to go back again. I’ve found that each time I’ve stepped in the ring, I’ve come out a little bit bigger inside. I’m learning more and more that fighting isn’t always about getting angry to win, from my perspective it’s about responding with controlled aggression. It’s about taking that adrenal dump that hits you when faced with confrontation, your ‘fight or flight’ and turning your fear into fire. Into positive action to win the day. And again I know the only way I can really develop this skill is by making sure I am always out my comfort zone with my training. And it’s really down to me to make sure that happens. I’ve got around six weeks to go now before I compete again, and being honest I think it will be a tough fight. The easiest way for me to deal with any doubts or limiting beliefs that try and take hold is by training and pushing myself hard. I intend to stay focused on what I want to achieve and when it comes to the fight, to work hard and to listen. I know that as long as I am at my best and I give my best I should come away with a win. Have a good week and I’ll see you on the road.